“The Hikiyama Parades of Tsuchizaki Shinmeisha Festival”is thought of by July 20th and 21th by many people.But the ceremonial priests will be held on the first Sunday of May every year, the general chairperson of the year, the vice-committee It begins with “Inauguration Ceremony” of the chief and Toyama chairperson within each town. 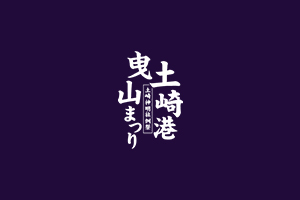 Meanwhile, in Hikiyama Votive Town, “Kuradashi” of Hikiyama is done from early June to early July, and Higashiyama production will come into full swing. 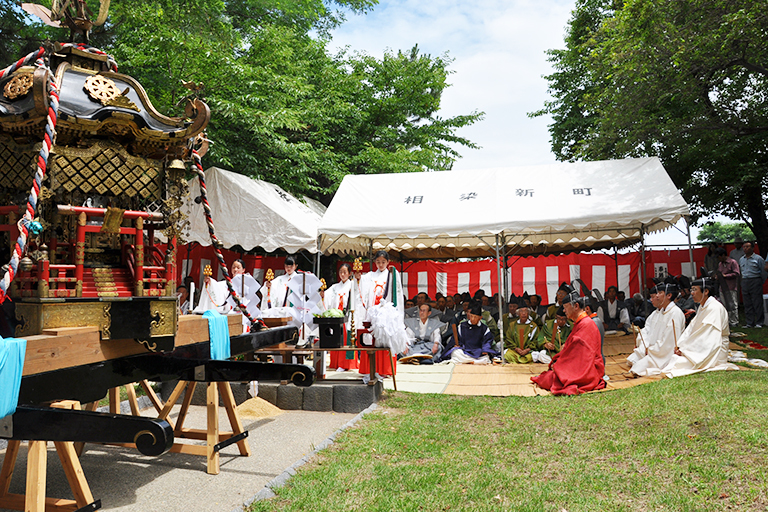 Various kinds of shrines continued every day, such as “Purification Ceremony” on July 1st “Koujin-sai” “Opening of the meeting place”, starting from the unified town and opening the meeting place every town, and the preparations for the festival It will be done steadily. 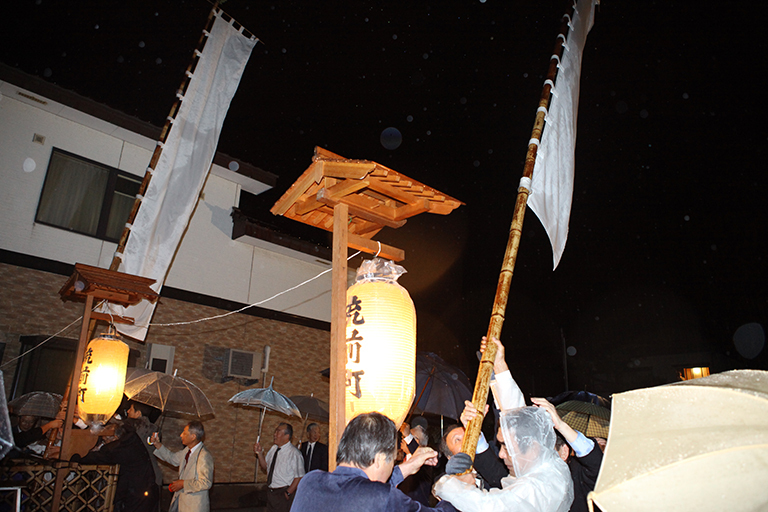 On the 20th, from the morning hikiyama in each town worships the shrine (“Goshamairi”) and from 6 pm at the Tsuchizaki Shinmeisya, “Yoimiya Festival” will be held. 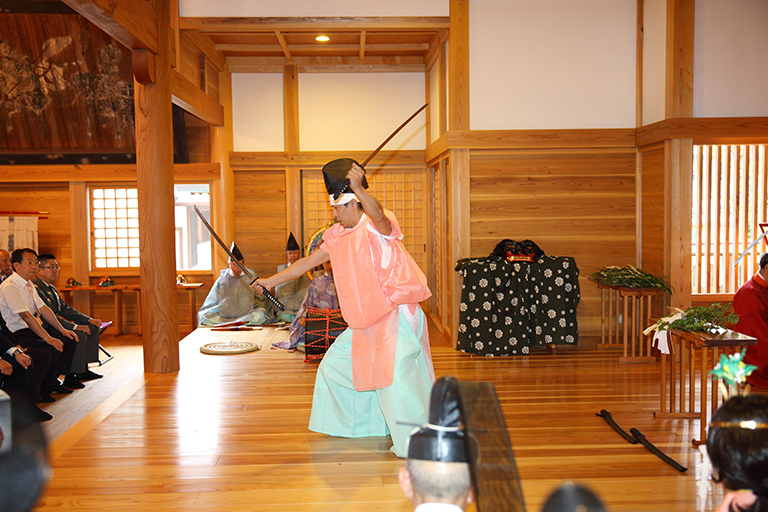 On the 21st, from the early morning the shrine such as “Houheishinji”, “Rei-taisai”, “Otabisho Festival” continues. After Otabisho Festival, Hikiyama continues with “Miyuki Yama (outgoing floats)”, “Modori Yama (return floats)”, and Tsuchizaki is excited. 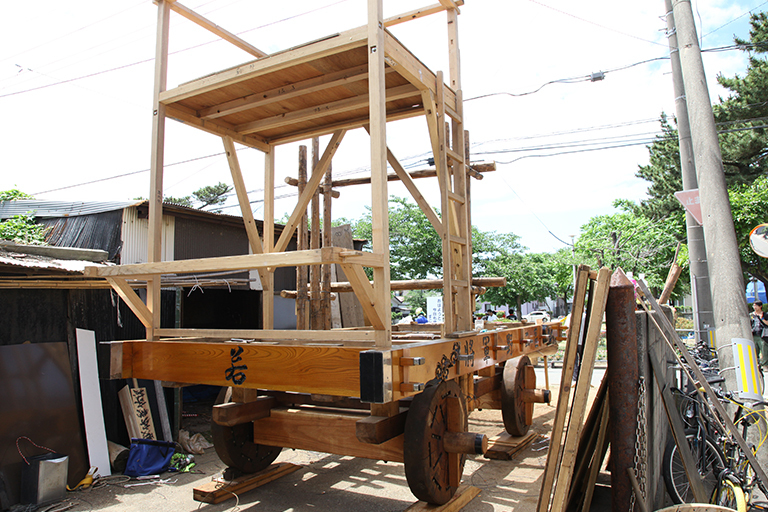 Then, on the 22nd of the day after the festival was over, Hikiyama was dismantled, and at the meeting place the “Syoujin Festival” will be held. After this, after the “Withdrawal” on the first Sunday in September, the priest of that year will end. Together with such a variety of shinto priests, such as competing for the taste of the looking back reflecting the passage of time, because it is extremely valuable as a festival event representing the area where the elements of the wind stream have remained remarkably, the important intangible folk cultural property designated by the country It is getting. Hikiyama is assembled by each town’s people, and decorations are sticking to commitment until just before the actual turn. The priest of Tsuchizaki Shinmeisya and suite visit and visit Generational, Sakaki-mochi, conspirator, priestess, chairman’s house, etc. and carry out exorcises. At 2 am on the 15th, the executives correct their clothes and set up a white flag before the convention site as a mark of the divine power of God that is coming down. A convention place is set up in the town where it is represented, and a divine act to bring God’s alter ego to paper. 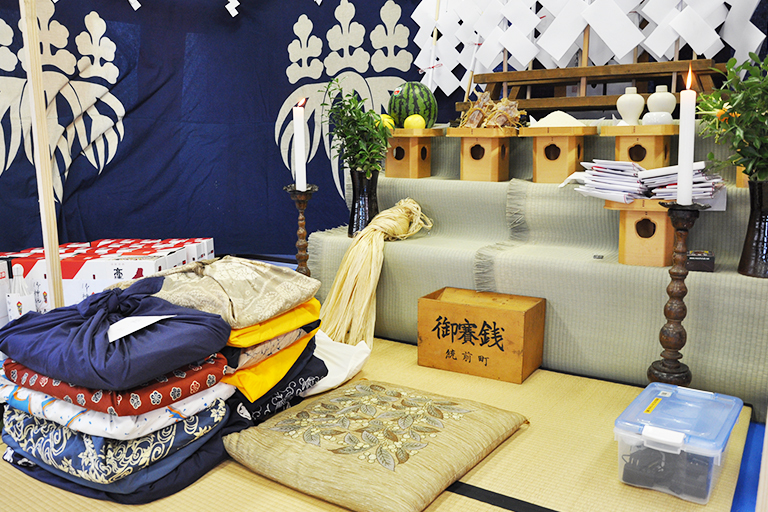 It is done in the form of a yukata as well as at the time of the festival. 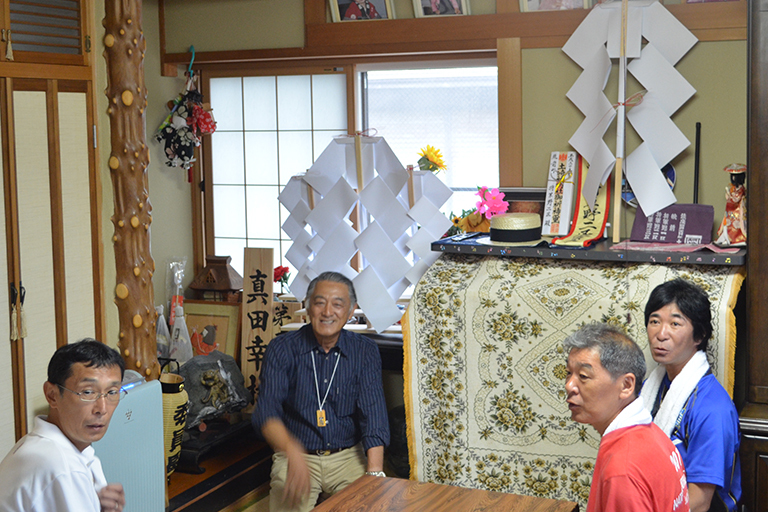 Like the mein meeting place, an altar that enshrines the he Amaterasu Okami god is set up. Every morning from the 16th day after Opening of the mein meeting place, it will be held by the priest and representative officials. 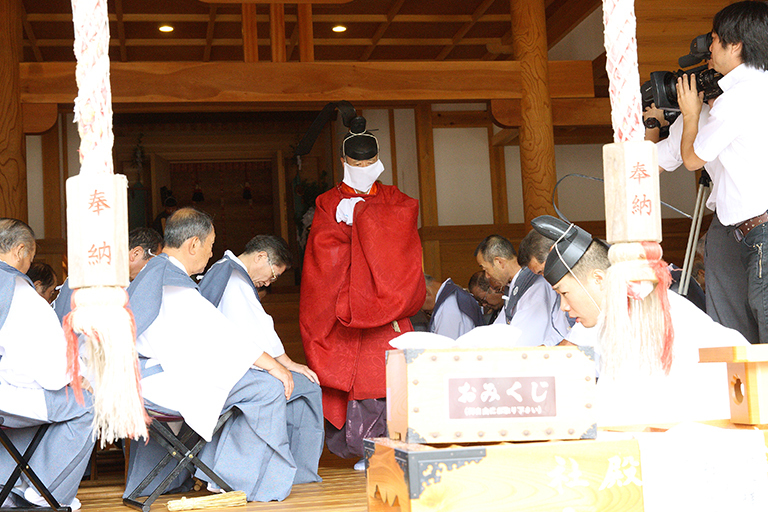 At the main shrine of Tsuchizaki Shinmesya, the representative stakeholders, Sakaki-mochi, and conspiratorwill attend. 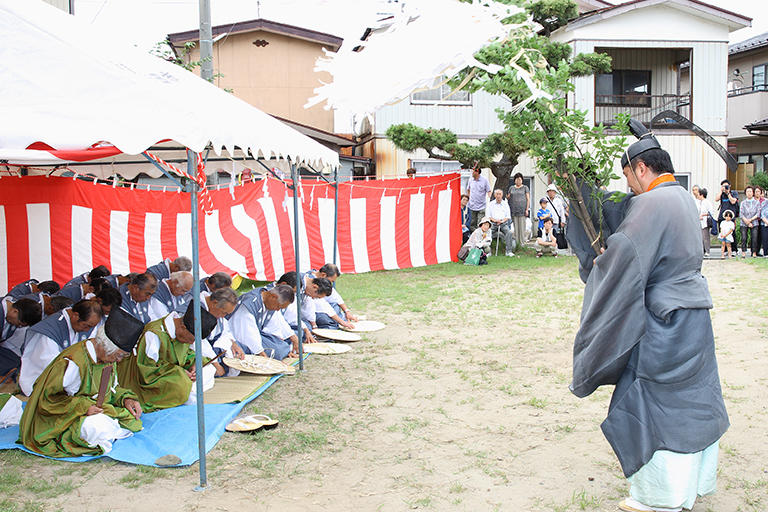 They cleanse clothing such as clothes, gowns, underwear etc worn by representatives of the town and representatives of the town, Sakaki-mochi, conspirator in the festival. Leave each town in the morning. They visit Tsuchizaki Shinmei company late morning and dedicate Hikiyama. 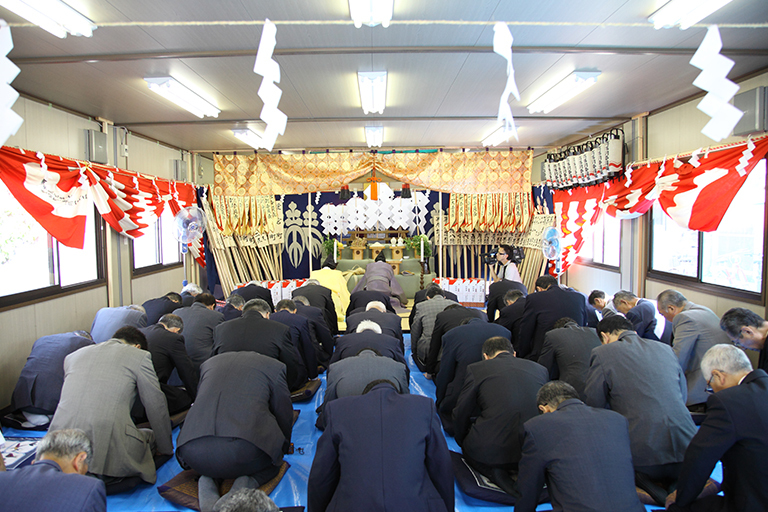 At this time, to honor God to dedicate, the hikiyama is pulled in front of the doll side. 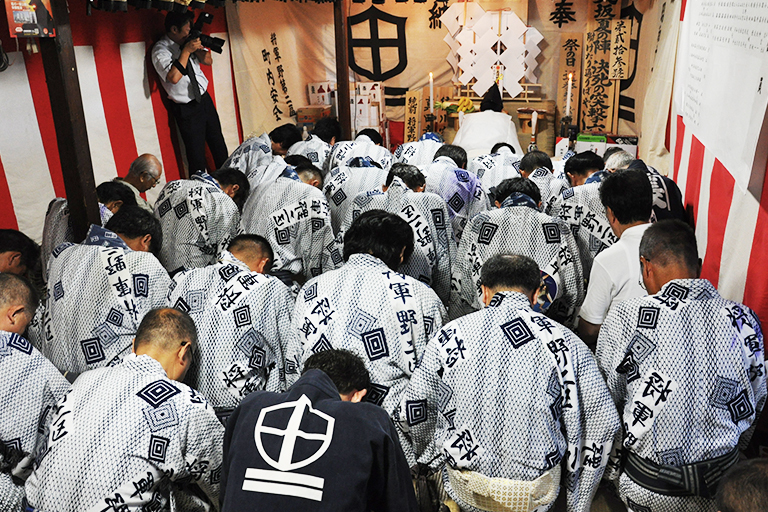 The sequence of sacred rituals to receive god into the Tsuchizaki Shinmeisha. 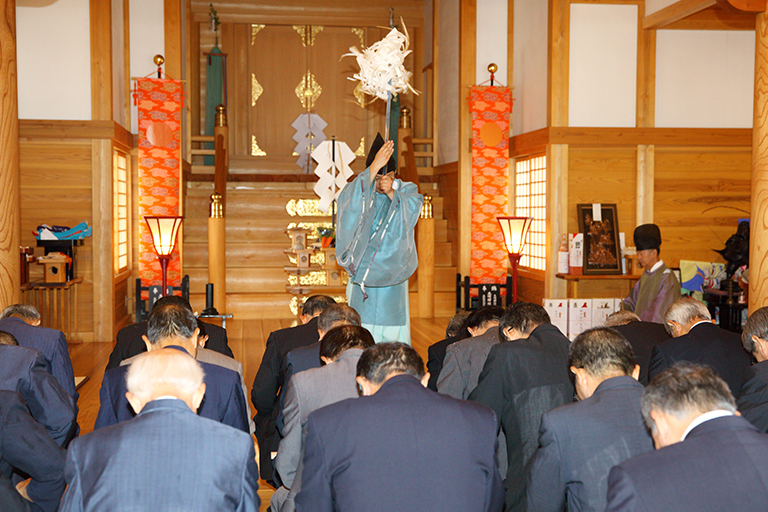 Purification rites, the offering of food and the chanting of prayers are performed, followed by a sequence of various dances including the sakaki branch dance, the sword dance, the urayasu dance and the lion dance, finishing with the offering of a sprig of a sacred tree (“tamagushi”). 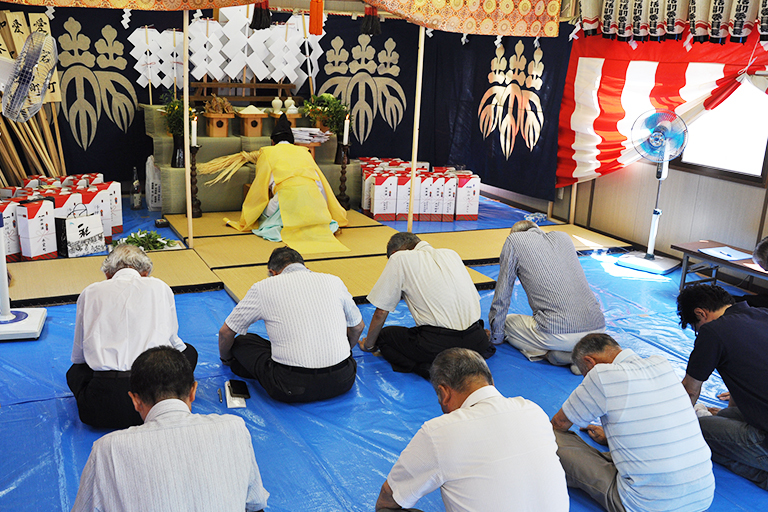 Houhei-Shinji is the ceremony which prayed for safety in the way of pulling the portable shrine. 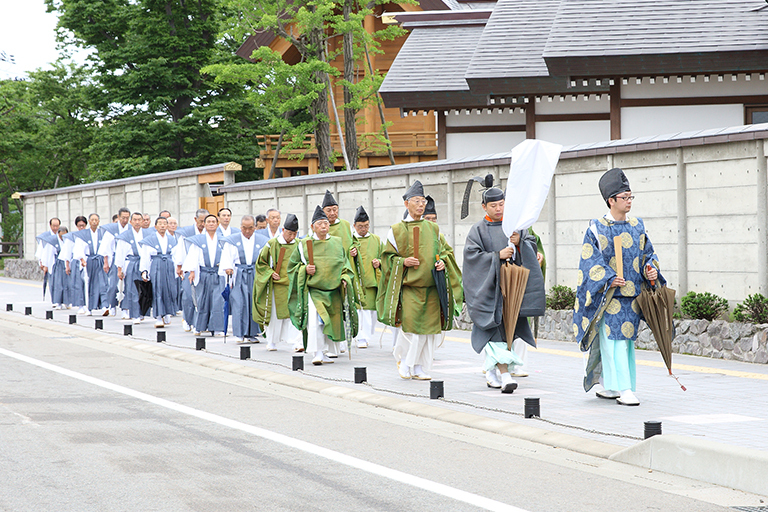 Priests take the divine spirit who has come down to the sacred paper of the meeting place to the main building of Tsuchizaki Shinmeisya. 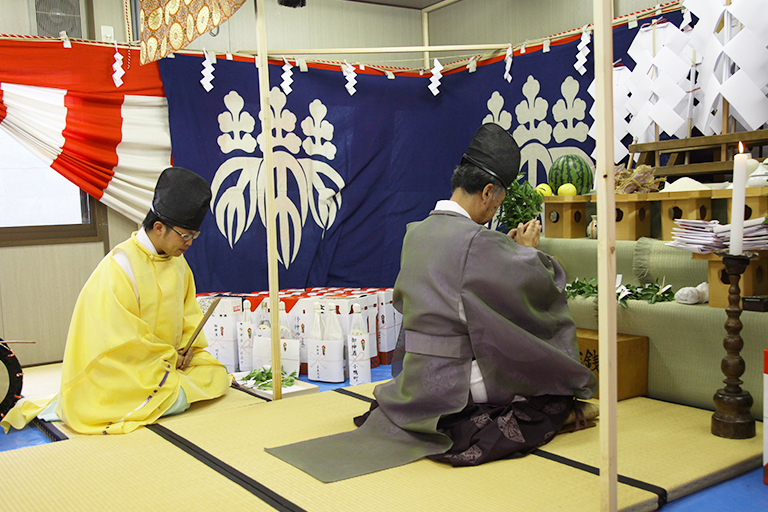 “Purification rites, the offering of food and the chanting of prayers will be performed, followed by urayasu dancing. 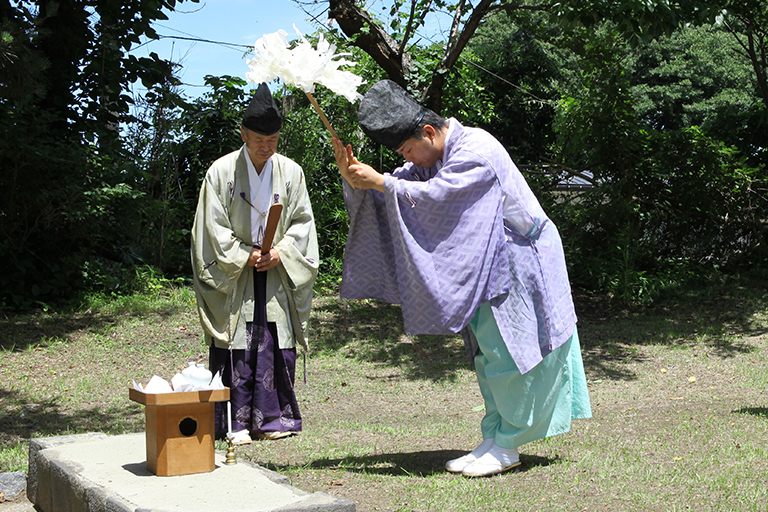 After the urayasu dance, a broom dipped in a boiling pot is offered to visitors, who can use the broom to purify themselves with the drips of hot water. 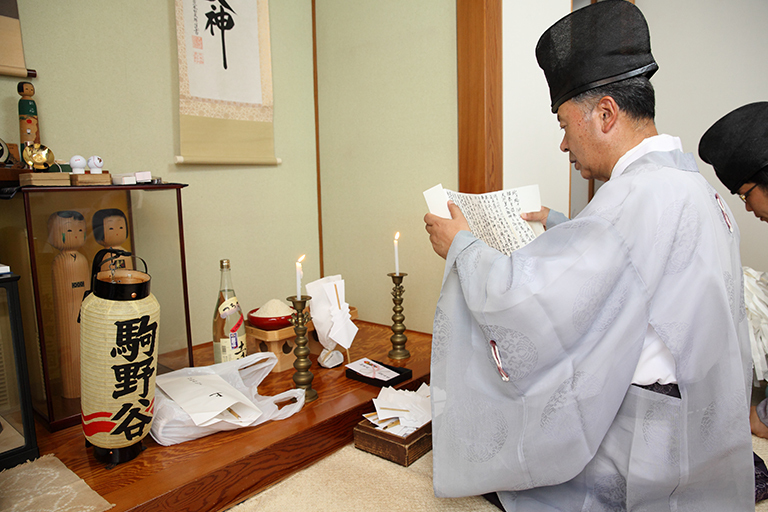 The priest moves the division of God who lives in the sacred paper in the main shrine to the portable shrine. At this time, the priest moves on white masked white gloves so that they do not breathe or sweat in the division of God. 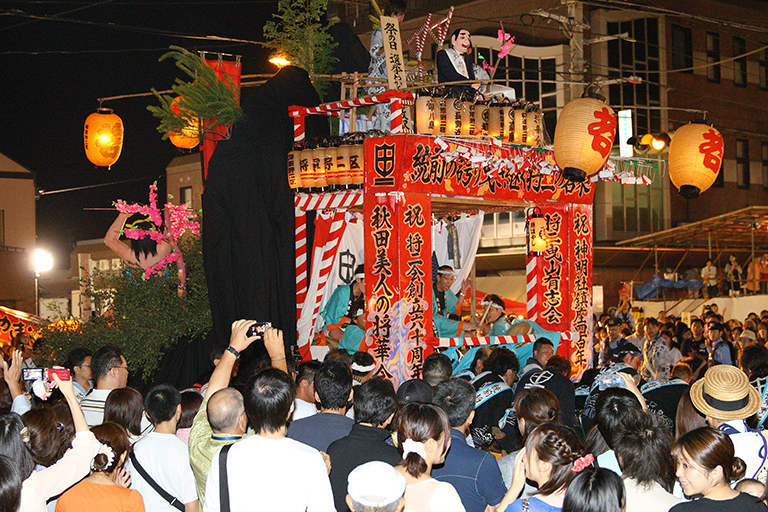 On the way of passing the shrine, a mikoshi stops at Kokubo-cho and Sozenmachi shopping mikoshi, and a festival is held. 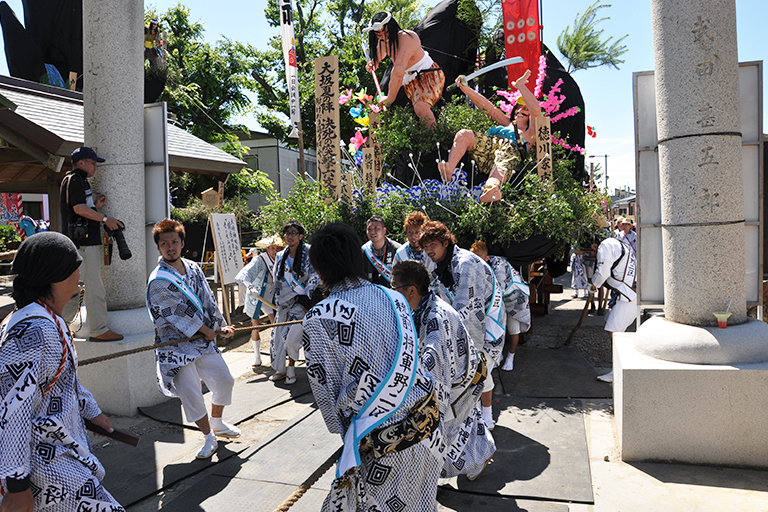 After finishing the festival in Kokubo-cho and watching the shrine, it will be “Miyuki Yama” heading toward Sozenmachi . The festival is exciting, such as departing each town in turn, continuing to Honcho street, and performing arts everywhere. 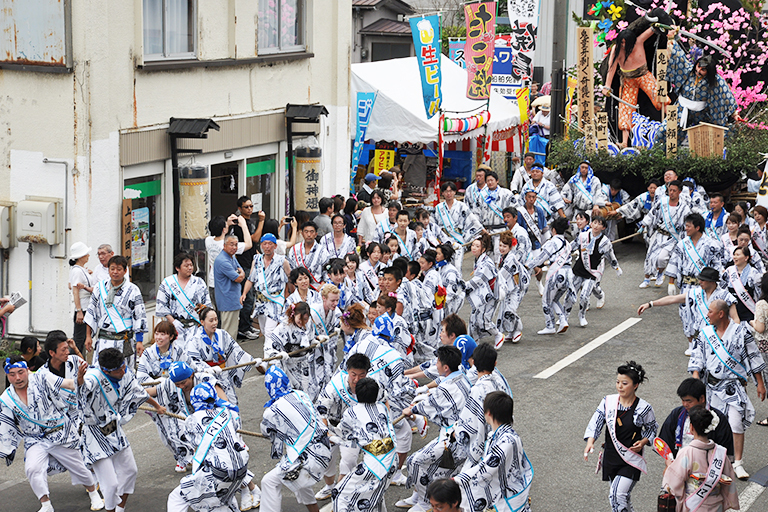 As well as Kokubo-cho, Otabisho Festival is also held at Sozenmachi. 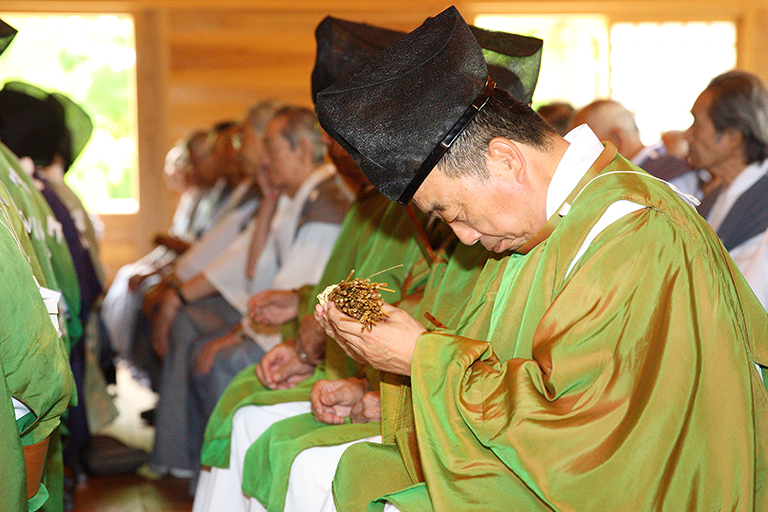 As well as Syutsugyo Festival , the priest return the divine power of God to the main shrine from the shrine during the warning of the priest “oh”. Each town starts in order and returns to the town itself. To the melancholy tune of “Aiyabushi” music, This is where the excitement of the festival reaches its peak. 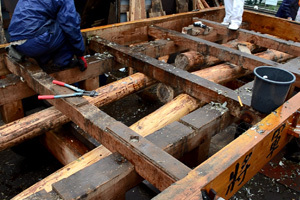 Disassembly of Hikiyama, which was assembled over a long period of time, will be completed within 22 days. The Spirit which was despaired at the convention site is returned. 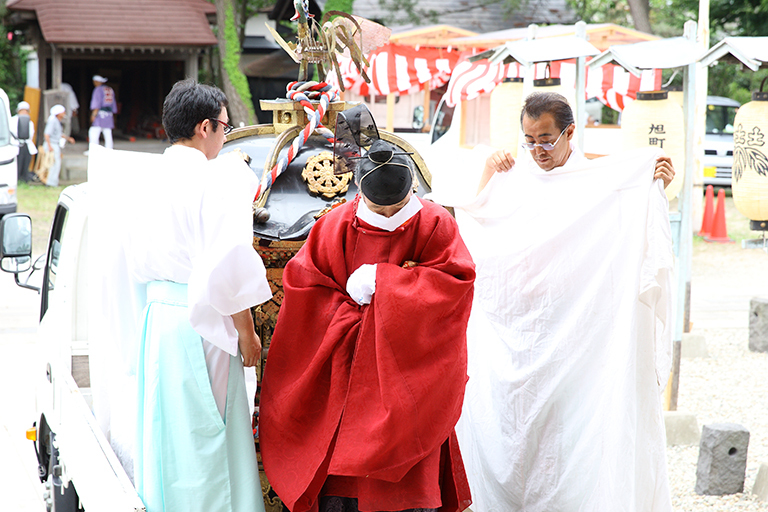 The spirit who was descended to the meeting place with the warning of “Oh” by the priest is returned to heaven, and the series of festivals of the festival is over. In each town, we will pay the bills and bills to the chairperson and officials’ home, and then we will pay the fee as a festival’s consolation and close down.